Seniors Law NSW was established in 2016 to provide legal assistance to older people experiencing or at risk of abuse through the Health Justice Partnership (HJP) model, in which a lawyer is embedded in a health service to reach vulnerable people who would otherwise likely not access legal help. It builds on the work of Seniors Law Victoria, which has 10 years’ experience designing and delivering legal services in health care settings. In 2016, Seniors Law NSW established an HJP with St Vincent’s Health Network (SVHN), which consists of St Joseph’s Hospital in Auburn and St Vincent’s Hospital and Sacred Heart Health Service in Darlinghurst. This HJP involves our lawyer working onsite four days per week across the three sites. We are now establishing a second HJP with the War Memorial Hospital (WMH), a sub-acute hospital in Waverley with a focus on aged rehabilitation services. It also operates the ‘Geriatric Flying Squad’, a multi-disciplinary team of health professionals that assesses and treats older people in their own homes and residential aged care facilities. The successful applicant will play an active role in all aspects of the work of Seniors Law NSW, including within our HJPs with SVHN and WMH. The successful applicant will have the opportunity to work closely with supportive health teams, older clients, pro bono firms and evaluators. The role presents a unique opportunity to be part of an innovative, multi-disciplinary service for older clients experiencing or at risk of abuse. The successful applicant will be critical in developing our HJP with WMH, and in building on our significant work with SVHN where we have established strong relationships with many teams and staff from all levels of the organisation. With high levels of trust between professionals in a HJP, there is a great capacity to collaborate to address legal and non-legal issues for older people experiencing abuse. This makes the HJP a highly effective model to address complex elder abuse matters, as well as provide opportunities for early intervention. Not only will the successful applicant receive mentoring, training and support from Justice Connect to develop a specialisation working with older people and in HJPs, but they will also feel part of the supportive health teams within our HJPs, where they can develop their understanding of the health sector and improve both legal and health outcomes for clients who are experiencing significant disadvantage. Working alongside health professionals in the hospital setting, support older patients identified as experiencing or at risk of elder abuse through the provision of direct legal assistance, and by building the capacity of health staff to respond to the issue through education and secondary consultations. Demonstrate leadership in the design of our existing HJP with SVHN and in our new HJP with WMH, working closely with health teams, older clients, pro bono firms and evaluators to deliver improved legal and health outcomes for older people experiencing or at risk of abuse. Provide secondary consultations on a broad range of legal issues to assist health professionals. Conduct intensive legal triage with clients experiencing, or at risk of, elder abuse and other legal issues associated with ageing. Provide targeted legal advice and discrete casework on-site at the health services — as well as at outreach locations in the community — and appropriate information, referrals and resources for older people. Oversee referrals to pro bono firms, including providing guidance to pro bono lawyers and responding to clients. Develop strategies to be visible within the health services and to engage with health professionals, such as attending case conference meetings with multi-disciplinary teams, aimed at supporting staff to identify potential legal issues and appropriate referral pathways. Identify casework trends and systemic problems impacting on older people and engage in various initiatives — including projects, law reform and advocacy activities — to address these problems. Develop and maintain collaborative relationships with key stakeholders, in particular, health professionals, pro bono lawyers, evaluators, other community services, networks and funders. Develop resources and deliver education promoting the legal rights of older people tailored for health professionals, pro bono lawyers and community members. Collect data to assist with monitoring and evaluation. Participate in working groups and committees focused on the legal rights of older people. 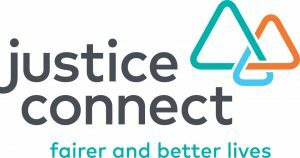 Actively participate in promotion activities, including by representing Justice Connect in a range of public forums, delivering presentations and contributing to internal and external publications. Assist with the governance, fundraising, reporting and evaluation requirements of the program including reports for the Justice Connect Board and funders. Perform other duties as directed and necessary to the proper performance of the role. This job description outlines the current duties and responsibilities of the position. These will be reviewed on a regular basis with the position holder and are subject to change according to the needs and priorities of Justice Connect and our health partners. The successful applicant will need to undertake a national police check and working with children check, and provide satisfactory immunisation results prior to commencing work on-site at the hospitals. If you are enthusiastic, driven, organised, enjoy working with both older clients as well a broad range of stakeholders, and have a minimum of two years post-admission experience, we would like to hear from you. Applications should be emailed to hr@justiceconnect.org.au as a single word or PDF file including “Lawyer, Seniors Law NSW” in the email subject line. Please quote in application: Lawyer, Seniors Law NSW via Pro Bono Australia.